Tsambagarav National Park is located in between Khovd and Bayan Ulgii Province in Western Mongolia. The park is named after the Tsambagarav Mountain which is part of Altai Mountains Range. 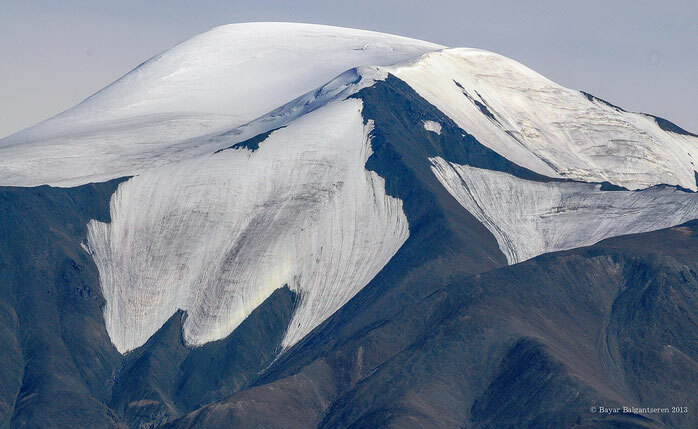 It is one of the highest mountain 4165 meters sea level and considered one of the highest mountain in Mongolia. The scenic park is known for its stunning vistas and diverse wildlife. Many endangered animals live in the park. Snow leopards, snowcocks,Argali sheep, Ibex and many more wild animals inhabit in the park. Though not all can be easily found, especially the snow leopard. The park contains many glaciers, rocky gorges, glacier lakes and 7 meters high waterfall flows down a narrow gorge. During summer, the valleys north of the mountain are very green and in winter mountain is covered with snow. During summer time Kazakh and Uriankhai families spend their summer in the bottom of the Tsambagarav Mountains. Tourists can visit local families and experience their great hospitality. Their doors are open to everyone and they offer best of their services to welcome visitors. Tsambagarav Mountain is ideal place for trekking, horse riding, photograph and cultural tours. Therefore, best time to visit the National Park would be between mid of June to end of August to visit local nomads and stay in a Yurt with family. As well as in winter time local hunters hunt with their trained eagles around mountain.